GeekVape Eagle: Griffin 25 with wider chimney and removable drip tip. 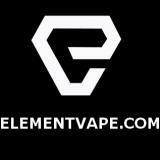 Coils here, make sure to check all the different styles. Authentic Tesla Shadow: Simple, replaceable notch coils, clean design. I dig it. Fortuna: Just had to list it for the graphics honestly. Taster Styled RDA: It's tiny, its glass, I want it. M-Atty Styled RDA: Random colors >.> I've heard extremely good things about this atty. Griffin 25 Mini: Griffin 25 Mini! Hype! Magma Reborn: Yet another contender in the genny/autodripper game. 24mm, ultem plug, lots of airflow options. Authentic Vapmod Cupie: Top fill, top airflow, ceramic guts. Neat. PAN Cake Styled RDA: Comes with ultem top cap, and bottom feeder pin. Authentic Smoant Mobule RTA: Single or dual coil, top and bottom airflow, fits notch coils (or atleast from the pictures), juice flow control and the biggest feature "Invisible Air flow"
Silicone + Resin: Lots of awesome colors, interested to see how silicone performs for a drip tip. Glass + Aluminum Drip Tips: Love the shape, not really sure how I feel about the height though, but I'm spoiled by the Derringer drip tip honestly. POM + PEI Drip Tips: 4 pack, actually really love all 4 styles here. Singles here. Authentic Joyetech Evic vTwo Mini: 75w, TC, clock, single 18650. Comes with the tank and uses the new QCS/LVC head system. Silicone 18650 Holders: 5 pieces, 5 colors, 7 bucks, not bad. Singles here, each color in drop down. Youde Wires: Youde stepping up the premade wire game. Staple staggered fused clapton wire. Check out the others in dropdowns. RX200S Front and Back Plates: Various colors in the dropdowns. Magnets! : Build stuff! I love stuff like this. 8bitdo Bluetooth Controller: Check out the different styles. Hopefully you have small hands for some of these or else you will be cramping like crazy. Ultrasonic Cleaner: Ultrasonic Cleaner with dual power modes. EU version in drop down. Lego Raspbery Pi Case: Lego Pi Case? Yes please. Electric Kettle: Temperature. Control. Drops. Mic. Harem Pants: I just... What? Authentic uWell Crown 2: 24mm overall, 5ml capacity, new coils (cone top for "smoother airflow" ??). Looks like a nice set of upgrades without changing too much. [4 Pack of coils here](https://www.fasttech.com/products/5027801), available in 0.25, 0.5 and 0.8 ohm coils. Authentic Cubis Pro Tank: 22mm, 4ml capacity, top air flow, top fill. Uses new QCS (Notch) and LVC (Clapton) coils. QCS = Quick Change System = Easily comes apart to change the cotton around the notch coil. LVS = Liquid Valve Control = Control the juice flow to the clapton coil. Intersting concepts, hopefully they execute it well. Ravens Moon Styled RTA/RDA: You can run this in RDA, 4ml RTA, or 7ml RTA. Not a fan of the "gold" accents, or the entirely plated deck, but still an awesome design considering what all you can do with it. Payload Styled RDA: All in one barrel and cap. The main thing to point out here is that 510 pin >.> Perfect for hybrid (think Noisy Cricket) or just hideous? Velocity V2 Styled RDA: That ridiculous glass top from last week is back (and labeled properly), also comes with the regular Velocity top cap. Also wanted to point out this is the version with the quonk ready 510 pin. Underground Styled RDA: The deck is like the LowPro RDA, except the rest of the atty isn't tiny. I really like the aesthetics on this, and it looks like you have plenty of airflow options. Ares Styled RTA: Couldn't pass this beauty up. 31mm diameter, uneven height posts, no post holes, and that awesome "sleeve". Reminds me of the Fogger, but much much worse. 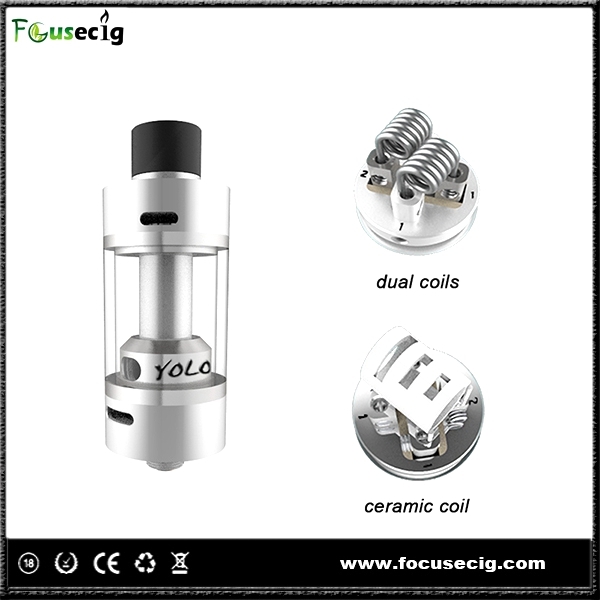 Authentic Fousecig YOLO RTA: YOLO is what you'll be saying if you try to build dual coils on this thing. They offer a ceramic coil that can be used as a single coil option. Standard RTA features here, top fill, glass tank, etc. Pictures of coil configuration here..
iWodeVape Wide Bore 5 pack: Now in rainbow and any other style you want. SS Wide Bore: Available in multiple colors, should fit most 22mm RDAs. Vaper Tweezer: They keep adding things to these. They are starting to become the Swiss Army Knife of vape tools. Now they have a 2 fold out screwdrivers. LED Jerusalem Cruisers: Just in time for summer. Multiple colors and styles available. Skull Head Decanter 1000ml: Also available in 500, 300, and 125ml sizes. Zombie Style 450ml version here. Looks to be another **Sunday Sale** coming up. Coupon **DEALS** for 15% off on a few vape products. Details posted on FT here.. Authentic AugVape Merlin: Black and Silver in the drop downs. No longer a pre-order. Ships next day! Authentic IVOGO Hulk: 25mm RTA, 3ml capacity, available in black, silver and gold. Authentic Kepler Apache RTA: 25mm RTA, 6ml capacity, top fill, black and silver in the drop downs. Intersting twist to open hinged top for top fill. Flame Styled RTA: 22mm auto dripper/genesis. Dual coil only (no blocker for other side). Has a dedicated fill hole with a nice chamfer to it. No Pity Styled RDA: 22mm, lots of airflow options, second sleeve included that has even more airflow. The post holes should be able to fit anything you can build, but getting the coils in might be a real PITA since its 22mm. SXK Kayfun 5: Currently pre-order, but SXK has always been good. Petri Styled RDA: Personally I hate full glass tops on drippers and this one is 23.5mm diameter... Weird size, but I know some people love glass top stuff. Aspire Nautilus X: "U-tech" coil system, top airflow, 45mm tall WITH drip tip. SS + Resin Drip Tips: Plain, simple, 21mm tall, multiple colors in the pack. SS Curved Drip Tips: 3 pack, 3 styles, double o-ring. Aluminum Drip Tips: 15mm, plain, but they have the small lip on them. SS Drip Tip Stoppers: Like the POM ones from the previous FTSD, but in SS. iWodeVape SS Atty Stand: Atty holder for doing builds. E-Cig Display Pad: More styles added since the last time I included these. 7.6cm Dragon Ball Singles: Want just one Dragon Ball? Or just want them bigger? (giggity) Here ya go.